The nominee to head the FBI didn’t signal that any changes to transparency over government surveillance are coming. If James Comey is confirmed to be the next director of the Federal Bureau of Investigation, he will naturally find himself at the center of the rapidly evolving debate over government surveillance. The FBI is often the organization making applications to the Foreign Intelligence Surveillance Court, which, as we’ve learned thanks to Glenn Greenwald at The Guardian, is authorizing all sorts of broad, and deeply troubling, surveillance. For instance, it was the FBI who made the now-infamous application to FISC mandating that Verizon turn over all of its telephonic metadata to the National Security Agency. 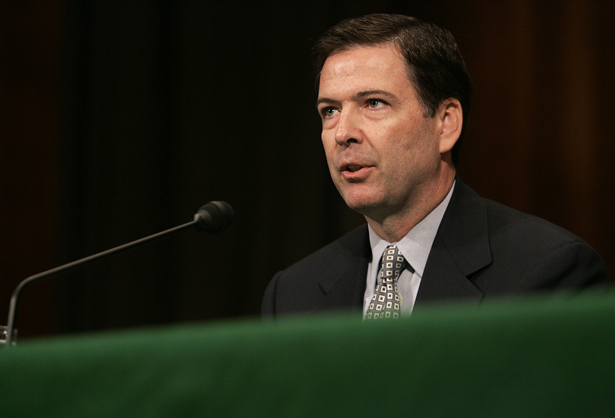 This means members of the Senate Judiciary Committee had a serious obligation to press Comey on this issue—not least because, despite his bold stance against the very worst excesses of the Bush administration’s surveillance techniques, he still approved several other problematic surveillance programs. To their credit, some senators did so. Comey’s responses, taken in total, were quite troubling—and signified that the administration isn’t ready for the “debate” that President Obama claimed he wanted about the government’s surveillance programs. Several senators focused on the opaque nature of the FISC. Comey was asked repeatedly if FISC was a “rubber stamp” for government surveillance requests, and not a meaningful check on executive authority. COMEY: Sometimes folks also don’t understand what the FISA Court is. They hear “secret court,” sometimes they hear “rubber stamp.” In my experience, which is long, the FISA court—folks don’t realize that it’s a group of independent federal judges who sit and operate under a statutory regime to review requests by the government to use certain authorities to gather information. And it is anything but a rubber stamp. Anyone who knows federal judges, and who appears before federal judges, knows that calling them a rubber stamp shows you don’t have experience before them. I hear folks say that quite often, that the government is undefeated in front of the FISA court, so how can it be a real court? I know from criminal cases that—I don’t know of a case where a wiretap application in a criminal case has been rejected by a federal judge, certainly none that I was involved with. And the reason is, we [law enforcement] don’t ever want that to happen. So we work like crazy to make sure we have our ducks in a row, we have probable cause easily cleared, because if we lose that credibility with the court, we worry that we’ll have lost something that we can’t ever get back. So I know that in FISA applications and criminal applications for court-order wiretaps, the government is extremely conservative in putting together what it presents to the court. Here Comey is acknowledging that FISC approves virtually every government request before it, but only because, he contends, law enforcement is almost always operating with due cause—as is demonstrated by the near-total approval rate for surveillance applications in federal in state courts. That may reflect some deeper philosophical and legal problems with the American justice system, unless you believe Comey that law enforcement is always judicious with its surveillance requests. But put that aside for a moment—there is a huge problem with drawing parallels between FISC and surveillance courts. The aforementioned wiretap report details what types of crimes were being pursued for each requests; what the arrest rate was, and how the requests are increasing year to year. The analogous FISC disclosure of government requests and subsequent approvals contains almost no information. Also, in civilian courts, we can often find out the nature of surveillance requests after the fact, right down to the affidavits that were submitted. (To use a newsy example, here is what authorities told a judge when they wanted permission to use surveillance to nab former New York Governor Eliot Spitzer for soliciting prostitutes.) But FISC requests are never declassified. More importantly, FISC never discloses legal rationales that expand the legal basis for approving surveillance requests. When a federal or state judge considers a government surveillance request, the underlying legislation and case law is well-settled and public, and when courts revise the standards, we can read the opinions. We know the laws that allow NSA surveillance, but recent disclosures show that FISC appears to be dramatically expanding that legal authority. Senator Jeff Merkley, called on the White House to release summaries of “secret court opinions that include significant findings about the legal scope of the NSA surveillance programs.” Senator Dianne Feinstein—a strong defender of NSA surveillance—also wants those opinions released, as does the NSA director. SCHUMER: In order to make sure that we strike the right balance as a society, we need to know more about what the FISA Court is approving in these programs as they’ve been reported. My questions to you are as follows. First, would you be willing to support declassifying or releasing declassified summaries of FISA court opinions that have been issued regarding these programs, as Senator Merkley proposes to do in a bill that I am a supporter of, obviously with limitations on any security breaches? COMEY: Senator, I agree with you that transparency is a critical value, especially when weighing trade-offs between security and liberty. I am also aware that the Director of National Intelligence is looking at that very question. Because I don’t know what’s in the opinions, and I also I don’t know what’s on the other side in terms of concerns about classified information, It’s hard for me to say at this point. I think it is a worthy exercise to look closely at it though. Comey could have continued his analogy with civilian courts and backed disclosure, but he didn’t. More importantly, his testimony was no doubt closely coordinated with the White House, which chose not to have their new FBI director embrace the debate Obama claims he wants. It’s certainly should be enough to cause concern among Senators when considering Comey’s nomination. Why should you care about Comey? Read this.